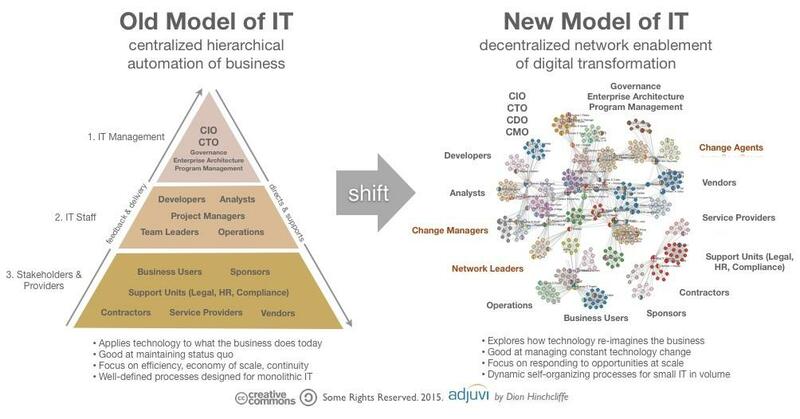 Promulgate the use and application of #Graphitization beyond its traditional roots in Enterprise Architecture. Appendix B – Amazon Leadership Principles is copy of the original text (non-graphitized) version of the Amazon Leadership Principles from the Amazon Jobs website. 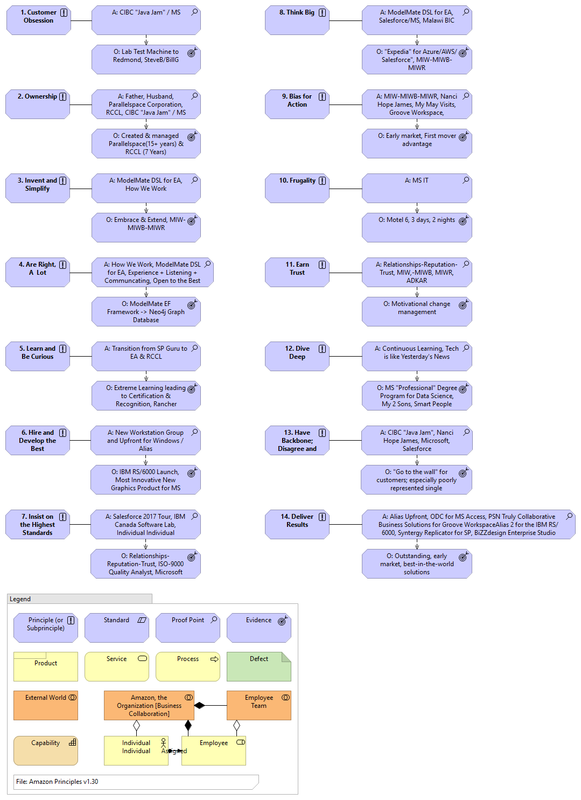 Appendix A – Amazon Leadership Principles (and Subprinciples) contains an ArchiMate enterprise architecture model that depicts the (and then decomposes) the 14 Amazon Leadership Principles into multiple levels of subprinciples. Scroll down to the bottom of this article to check it out. NOTE: The underlining in Appendix A attempts to highlight the individual Subprinciples and Relationships found in the text description of each of the 14 Principles. The first real section Amazon Leadership Principles, Core Entities, and Relationships presents a new innovative way to learn, remember, understand, and apply the Amazon Leadership Principles as highly visual web (or mesh or graph) of principles, concrete entities, abstract entities, and relationships. The last section (just before Appendix A), entitled Personal Leadership Principle Maps, depicts how the experiences and accomplishments of one person’s career (mine) can be (formally) mapped the Amazon Leadership Principles. All of the figures in this article represent different graphitized views of the Amazon Leadership Principles (click here) …all built from a single underlying graph model (which, in total, is referred to as the #Graphitization of the Amazon Leadership Principles). 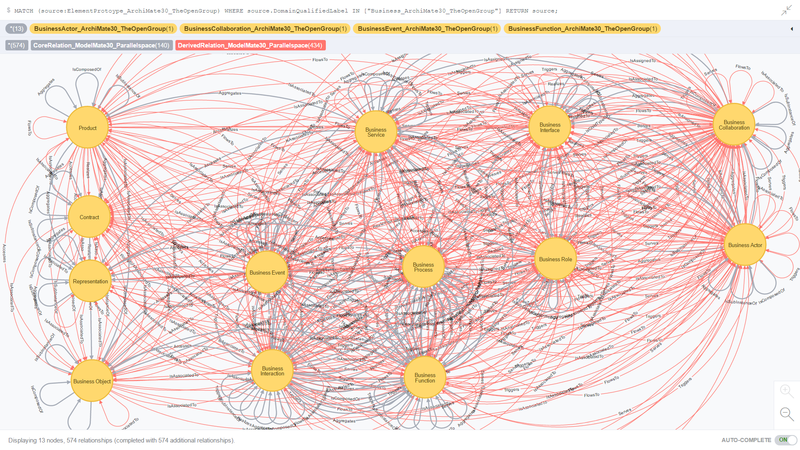 Visually, the model is expressed using the ArchiMate 3.0 visual language standard for enterprise architecture. The model was built with the latest version of Archi 4.0, the open-source, free enterprise architecture modeling platform. 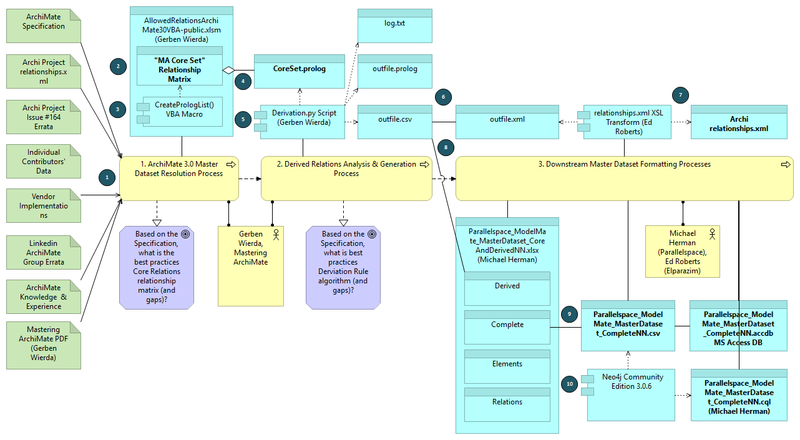 The latest version of the Archi .archimate model file created for this article be downloaded from here. This article concludes with a list of possible Next Steps for Iteration 2. The entities and relationships were deduced by inspection and analysis of each of the 14 Amazon Leadership Principles (classic business analysis, more or less). To simplify the understanding of the model, 14 new views were created – one for each of the 14 Principles – each overlayed on the original Core Model (Figure 1). Figure 3 is an example drawn from one of these 14 views: Principle 1. Customer Obsession. b) a Leader’s “attention to the Competition”. Figure 4. below is an animation of the Complete Model overlayed, principle-by-principle, against the Core Model. The individual views of the 14 Amazon Leadership Principles can be downloaded from here: https://www.facebook.com/mwherman/media_set?set=a.10155018158800932.1073741988.635655931&type=3. So far, we’ve addressed the “what” of the Amazon Leadership Principles depicted as a #Graphitization model projected as a number of different views. In the next section, the Amazon Leadership Principles are used as a framework for cataloging one’s lifetime experiences and accomplishments. Personal Leadership Principle Maps is an Amazon Leadership Principles application – it’s the Amazon Leadership Principles put into action. Have you been living an Amazon Leadership Principled career/faith/life? Figure 5. is a copy of my Personal Leadership Principle Map (PLPM). ArchiMate Assessment entities are used to model specific experiences and accomplishments. ArchiMate Outcome entities are used to model specific evidence, learnings, or proof that one has been able to apply the specific principle in their career, faith and/or life. In my case, for Principle 7. Insist on the Highest Standards, I have specific experiences related to the recent Toronto Salesforce 2017 Tour, working at Parallelspace Corporation, the IBM Canada Toronto Software Lab, and at Microsoft. Federation of Personal Leadership Principle Maps – at the Employee Team, business unit, or Organization level to discover the aggregates collective experiences and accomplishments for the purpose of rebalancing hiring objectives (Principle Gap Analysis), accumulating customer as well as competitive intelligence, etc. to support Customer Obsession, Ownership, Invent and Simplify, etc. goals and objectives. Identifying the best sources of experiences and accomplishments for specific Principles based on a Team’s or Organization’s previous roles, education, or training. 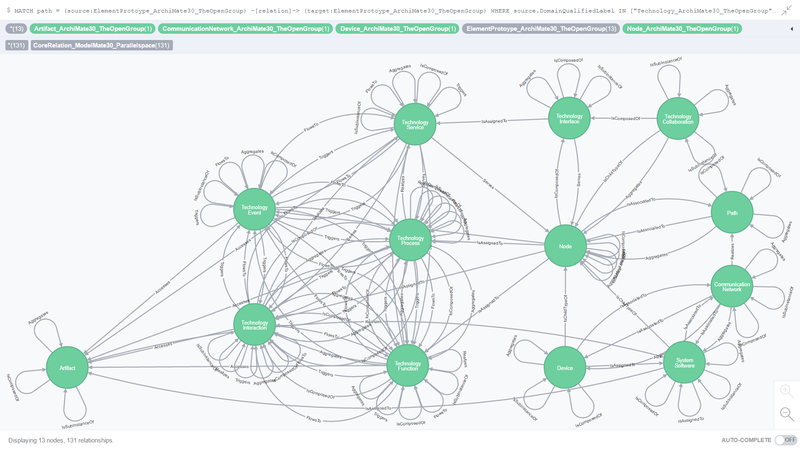 Use of both the Core Model and the Complete Model as well as the Federate Personal Leadership Principle Maps to create a graph database repository to real-time query analysis and visualization (e.g. 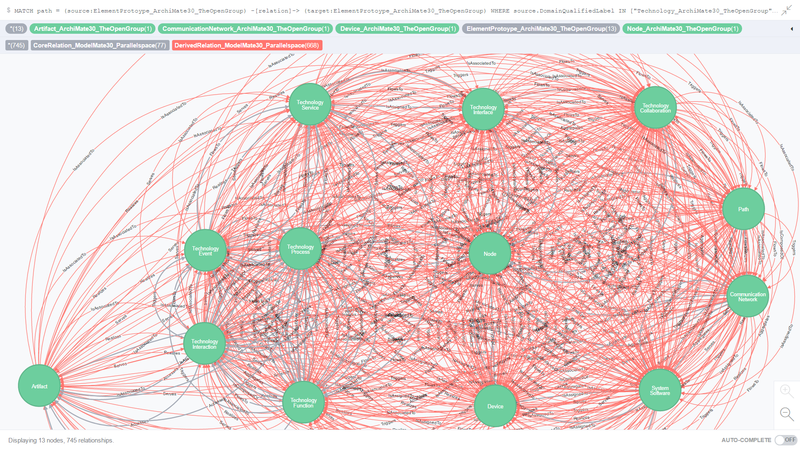 using the Neo4j graph database). To support Amazon’s operational data analysis needs (e.g. Amazon Marketplace 3rd Party Retail Data). Below is an ArchiMate enterprise architecture model that depicts (and then decomposes) the 14 Amazon Leadership Principles into multiple levels of subprinciples (as appropriate/as required). These are based on the text-based defintions of the 14 Principles found in Appendix B – Amazon Leadershp Principles. The following Leadership Principles are taken directly from the Amazon Jobs website. The sequential numbering (in parenthesis) was added by me. The underlining attempts to highlight the individual Subprinciples and Relationships found in the text description of each of the 14 Principles. Our Leadership Principles aren’t just a pretty inspirational wall hanging. These Principles work hard, just like we do. Amazonians use them, every day, whether they’re discussing ideas for new projects, deciding on the best solution for a customer’s problem, or interviewing candidates. It’s just one of the things that make Amazon peculiar. Leaders start with the customer and work backward. They work vigorously to earn and keep customer trust. Although leaders pay attention to competitors, they obsess over customers. Leaders raise the performance bar with every hire and promotion. They recognize exceptional talent and willingly move them throughout the organization. Leaders develop leaders and take seriously their role in coaching others. We work on behalf of our people to invent mechanisms for development like Career Choice. Leaders have relentlessly high standards – many people may think these standards are unreasonably high. Leaders are continually raising the bar and driving their teams to deliver high-quality products, services, and processes. Leaders ensure that defects do not get sent down the line and that problems are fixed so they stay fixed. Accomplish more with less. Constraints breed resourcefulness, self-sufficiency, and invention. There are no extra points for growing headcount, budget size or fixed expense. 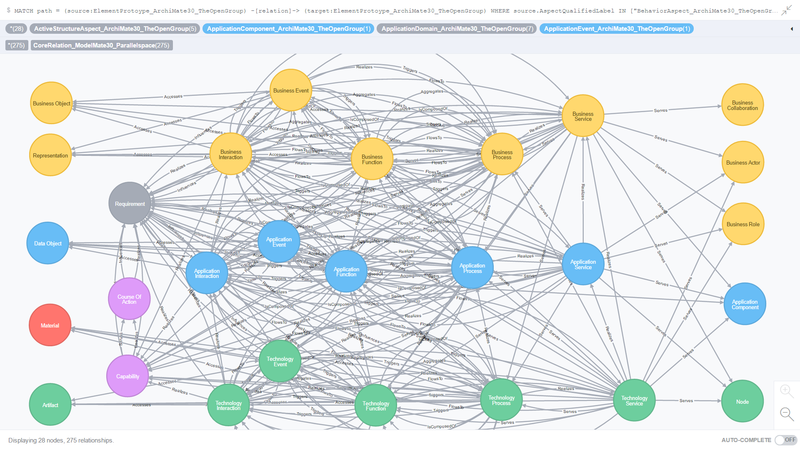 Wouldn’t it be nice to have an authoritative reference for ArchiMate 3.0, more specifically, a repository for the enterprise architecture language‘s elements and relationship matrix, that is queryable. This article documents the current iteration of the ModelMate project, Iteration 2, whose goal is to create an improved queryable repository for a corrected version of relationship matrix (more correct relative to the Appendix B tables in the current ArchiMate 3.0 Specification). In addition, there are almost weekly postings about usability issues or errors with the Specification in the Linkedin ArchiMate group, the GitHub Archi issues log, LinkedIn Pulse, and the Google ArchiMate group; as well as other forums . Crossing the EA Chasm: ArchiMate 3.0, fix it or re-purpose it? “[People should be] encouraged to try to model these examples for yourself: to start learning how to “think in ArchiMate” as your second or third written language.” The way the ArchiMate language is currently designed and, more importantly, described makes this difficult. In an abstract sense, the extension of the ArchiMate language is supported but, in reality, few if any broadly adopted extensions have appeared in the market. A better approach is described here: Crossing the EA Chasm: ArchiMate 3.0, fix it or re-purpose it? There is no single, authoritative, machine-readable version of the ArchiMate 3.0 relationship matrix; let alone one that is easily accessible and queryable. The Open Group’s insistence on using abstract terminology to name element types and relation types presents users with additional challenges. The tables contain all possible (valid) relations but do not differentiate between Core relations and Derived (non-Core) relations. All three issues are critical for the ArchiMate 3.0 Specification and these tables to be trusted and more generally useful. In addition, the Derived Relation Derivation Algorithm has never been published by The Open Group. Attempts to create an alternative algorithm have highlighted that the text of the ArchiMate 3.0 Specification is neither consistent nor complete when it comes to identifying the set of Core Relations and a correct and complete Derviation Algorithm. 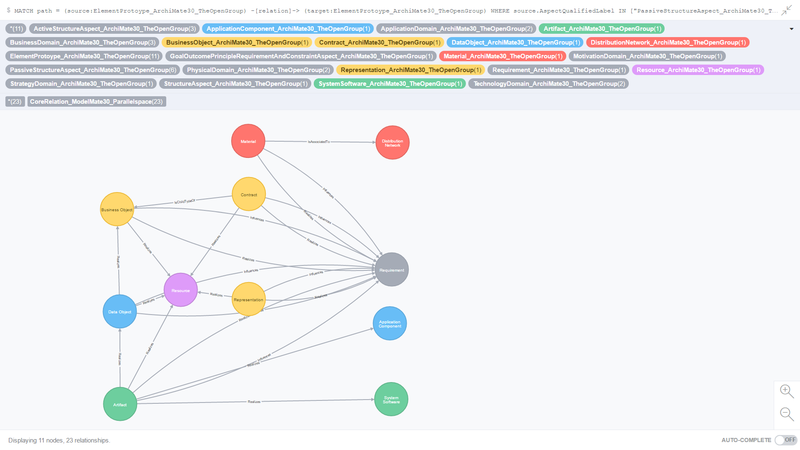 Lastly, when dealing with 1000+ Core Relations and several thousand Derived Relations (8000-9000 or more), it’s difficult to analyze and visualize what the ArchiMate 3.0 relationship matrix looks like in total, or when subdivided by Domain (Layer) or Aspect, or when focused on a specific element prototype (e.g. Node). When loaded into Microsoft Excel, the CSV and Microsoft Excel workbook format files appear as shown in Figure 1 (below). The Microsoft Excel (and CSV) format file can also be used with the Microsoft Excel Web App (Figure 2) and the Microsoft Excel format can be used to create custom SharePoint lists (Figure 3). When loaded into Microsoft Access, the Microsoft Access database format files appear as shown in Figure 4 (below). 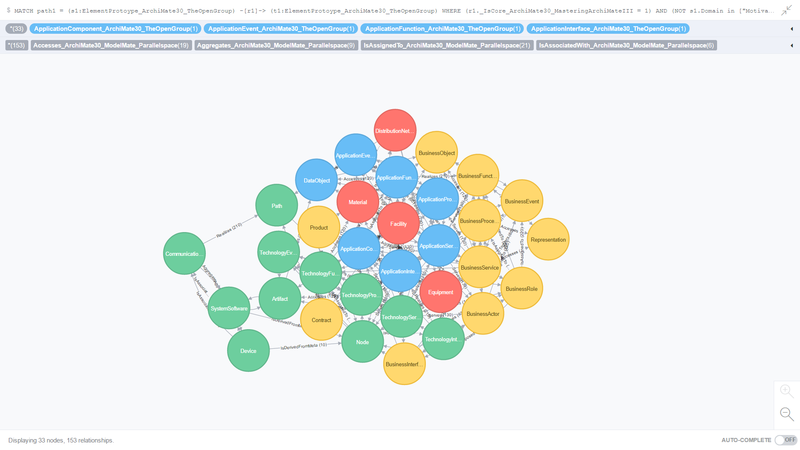 To create a queryable graph database version of the ArchiMate 3.0 relationship tables (in effect, the entire ArchiMate 3.0 metamodel), the Cypher Query Language (CQL) file depicted in Figure 5. was created. 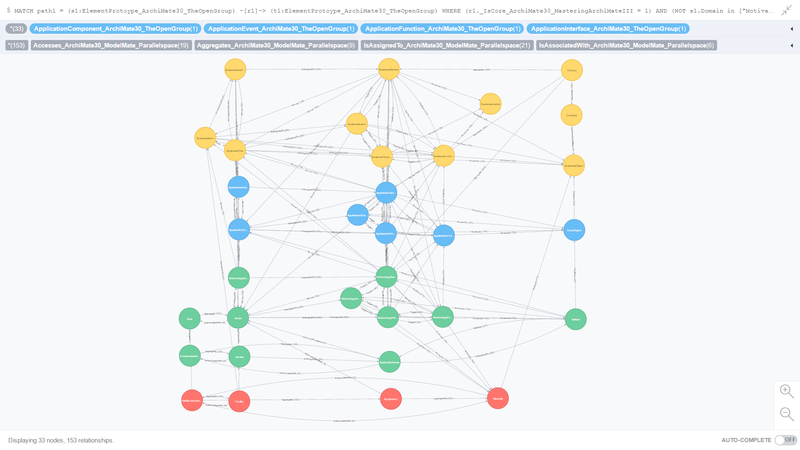 Figure 6 is an example of the output from a single line CQL query run against the ArchiMate 3.0 graph database (implemented using Neo4j). 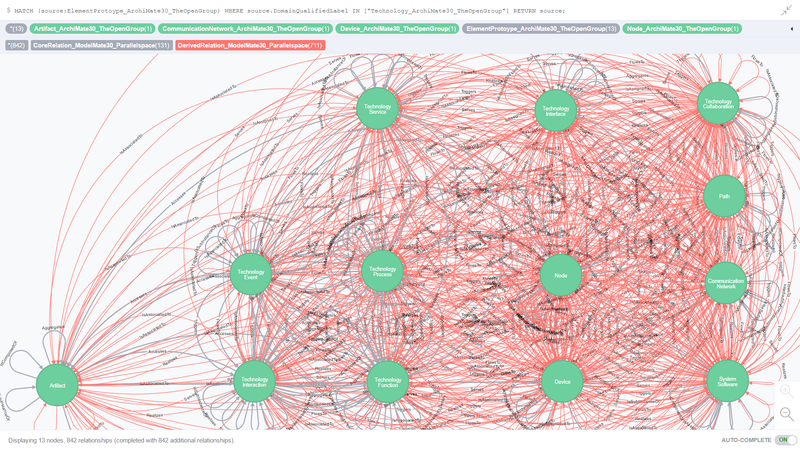 If you look closely at the CQL statement at the top of this screen shot (click Figure 6. to enlarge it), you’ll see that it is selecting all of the relationships across all of the element prototypes in the Technology/Infrastructure domain of the ArchiMate 3.0 metamodel that connect to the Node element prototype. You can download the files referred to in this article from the GitHub repository. Click here to download the ModelMate Master Datasets files. Lastly, there is Microsoft Access 2016 database version of the CSV file that is available for download if you prefer using Microsoft Access SQL queries or graphical SQL queries. 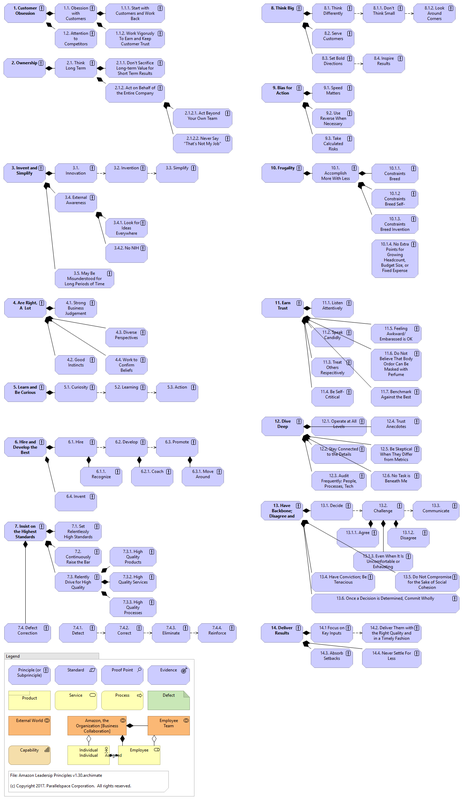 Below is a copy of the workflow and dataflow used to create the Parallelspace ModelMate Master Datasets. It’s not as messy as it looks – it’s true mashup and a valuable one at that. 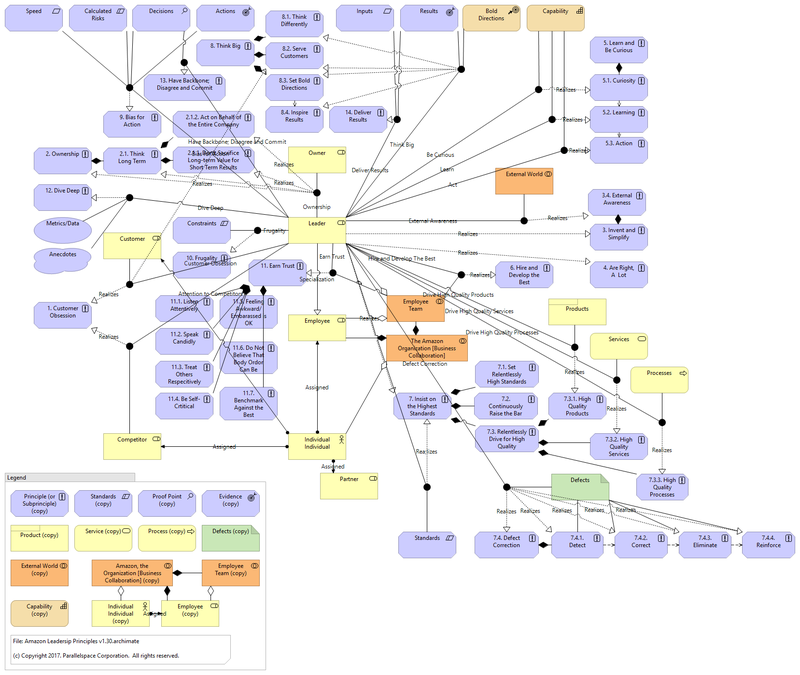 It’s primarily the result of the truly ad-hoc collaboration between 3 enterprise architecture professionals with an interesting mix of diverse goals (Gerben Wierda, Ed Roberts and myself); each of us with our own set of preferred development technologies and goals (with Excel being the greatest common denominator (GCD)). Data Sources. There are many sources of information about the ArchiMate relationship matrix in addition to the Appendix B tables in the ArchiMate 3.0 Specification. The list in Figure 7. is a fairly complete. 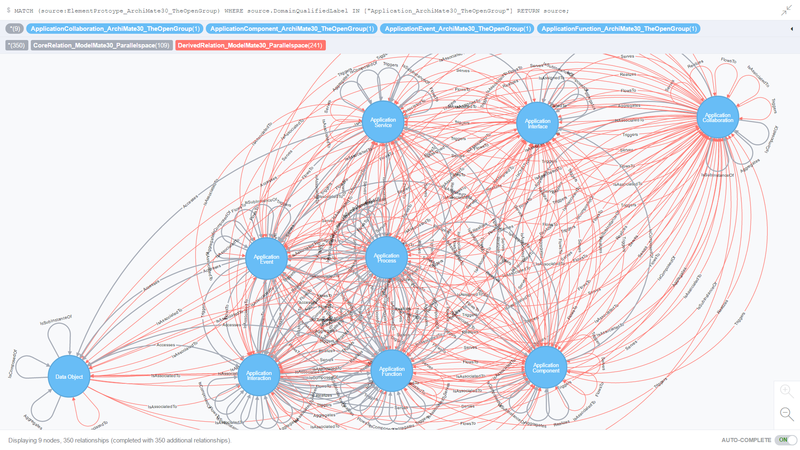 Key data sources include the GitHub Archi repository for the most widely used ArchiMate modeling tool for enterprise architecture and Gerben Wierda’s multiple ArchiMate resources publishing under the Mastering ArchiMate brand. “MA Core Set” Spreadsheet. Wierda worked to consolidate various data sources from Step 1 above to create the “MA Core Set” Mastering ArchiMate relationship matrix (plus a number of other relationship matrices that Wierda used for comparative analysis and troubleshooting purposes). The “MA Core Set” represents the “seed” or Core Set of (non-derived) ArchiMate relations. Wierda created this Core Set over several iterations reviewing the word-for-word text of the Specification, the inheritance diagrams, as well as incorporating his extensive practical knowledge and experience documenting ArchiMate in the book entitled Mastering ArchiMate – Edition II. The “MA Core Set” tab in the AllowedRelationsArchiMate30VBA-public.xlsm Excel spreadsheet also includes additional columns that are reserved for calculating and storing an intermediate 3-column, reverse-transposed version of the relationship matrix (Step 3 below). CreatePrologList() Visual Basic for Applications (VBA) Macro: This macro is used to perform the actual reverse-transposition of the “MA Core Set” relationship matrix into the 3-column format which including a column for storing the relation(source,target) 3-tuple formatted data (in Prolog format). The 2-D relationship matrix is the input to the macro (along with some additional master data tables that are part of the VBA code). The 3-tuples are the essential output of the VBA macro (stored “in-place” in the first 3 columns of the spreadsheet). CoreSet.prolog File. To proceed through to the next step of the workflow, the Prolog format data is copied from the spreadsheet and pasted into a plain text file called CoreSet.prolog, for example (or any other filename you would like to use). Derivaton.py Python Script and outfile.csv. The Derivation.py script contains is the “magic sauce”. Written by Wierda, Derivation.py reads the CoreSet.prolog file and executes a complex and detailed algorithm to expand the Core Set of ArchiMate relations read from the CoreSet.prolog file into a number of alternative output formats, including CSV and Prolog formats. 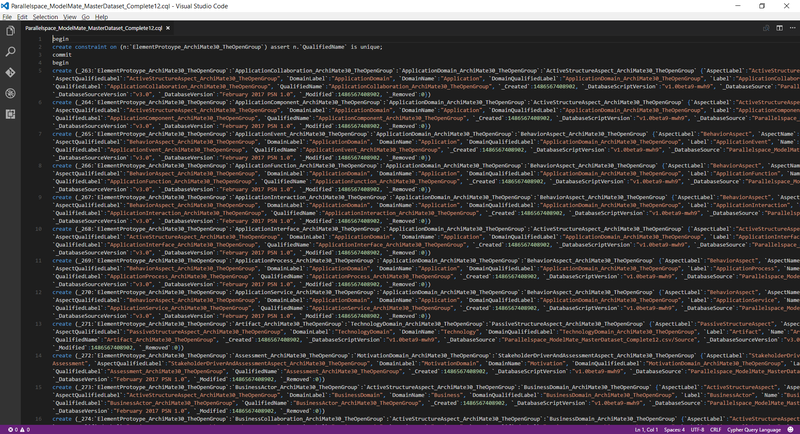 Outfile.xml File. Steps 6 and 7 are part of a sequence of activities that were used to create a relationships.xml file that is compatible with the relationship configuration requirements of the Archi modeling tool. This process, originally implemented by Ed Roberts, owner of Dallas-based Elparazim, uses Excel to load the outfile.csv save it out as an outfile.xml file. For Step 7, Ed Roberts wrote an XSL Transform script that when applied to the outfile.xml file creates the Archi-compatible relationship.xml that is used by the Archi model to automatically configure the element-element relations supported in a given version of Archi (e.g. Archi 4.0). Steps 8-10 mark an alternative data flow created to support the needs of the ModelMate Master Datasets project. In Step 8, the contents of the ModelMate-compatible modified CSV output from Step 5 (outfile.csv) is copy-and-pasted into the Parallelspace_ModelMate_MasterDatasets_CoreAndDerivedNN.xlsx Excel workbook (where NN is a version number). A matrix of automated Excel functions in the Complete spreadsheet merge the elements and relations master data attributes from the Elements and Relations spreadsheet with the data from the Derived spreadsheet to compute the corresponding column values in the Complete spreadsheet. Think of the Complete spreadsheet as a super-unnormalized version of the relationship matrix. The InInputRelation column values indicate whether a specific relation (and it’s companion source and target elements) are Core relations or Derived relations. Derived spreadsheet – copy-and-pasted version of the outfile.csv from Step 4. The “input” spreadsheet. Complete spreadsheet – leverages the master data in the Elements and Relations tabs to expand the columns in the Derived spreadsheet to include additional metadata property columns for the source and target elements as well as the relations. The “output” spreadsheet that will be saved as a CSV file in Step. 9. Elements spreadsheet – master data attributes and values for each element prototype. Relations spreadsheet – master data attributes and values for each relation prototype. In Step 9, columns 4-32 of the Complete spreadsheet are saved as a separate CSV format file (using the same versioned file name as the parent workbook but with a suffix of .csv). Also considered part of Step 9, the CSV file is imported into an empty Microsoft Access database. The datatype of the InInputRelation is changed to be a Yes/No (boolean) field. The database file is given the same name as the CSV file but with a suffix of .accdb. 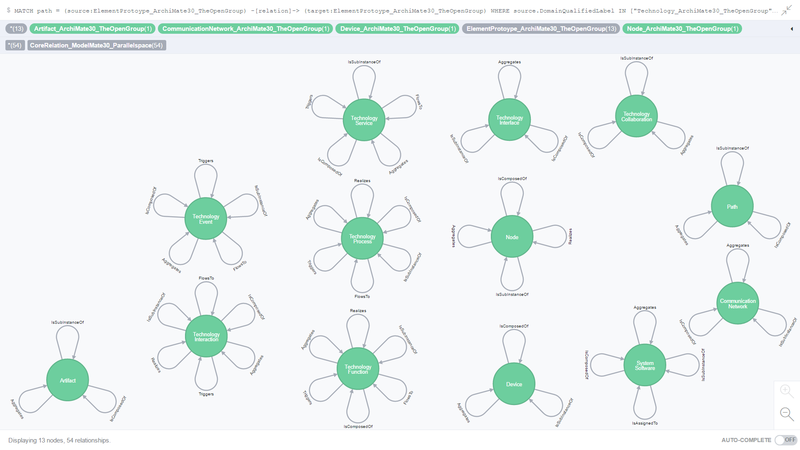 Step 10 uses a series of Cypher Query Language (CQL) script files to create and populate a Neo4j graph database – to enable simple but powerful ad-hoc queries against the ArchiMate 3.0 relationship tables/metamodel. Click on any of the figures to enlarge them in a separate browser tab. Figure 8. is the result of an ad-hoc CQL query against all element prototypes in the Business domain; more specifically, where both the source and target element prototypes are in the Business domain. Figure 9. is the result of an ad-hoc CQL query against all Core relationships where the source element prototype is from the Business domain. Figure 10. is the result of an ad-hoc CQL query against all Core relationships where both the source and target element prototypes are from the Business domain. Figure 11. is the result of an ad-hoc CQL query against all element prototypes in the Application domain; more specifically, where both the source and target element prototypes are in the Application domain. Figure 12. is the result of an ad-hoc CQL query against all Core and Derived relationships where the source element prototype is from the Application domain. 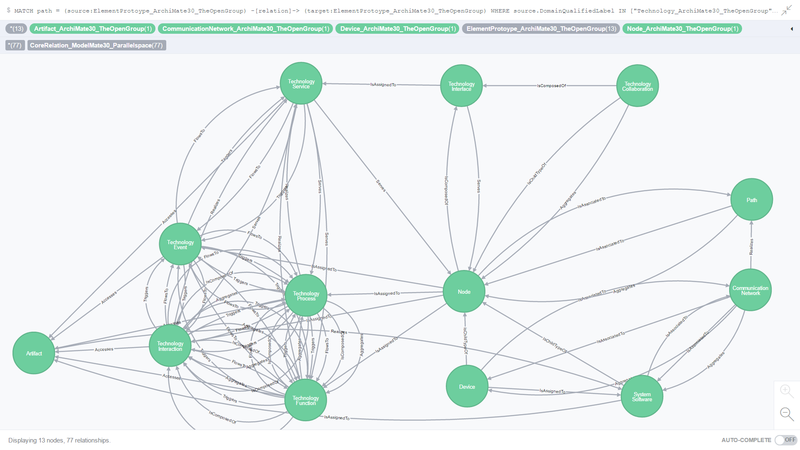 Figure 13. is the result of an ad-hoc CQL query against all Core relationships where both the source and target element prototypes are from the Technology/Infrastructure domain. Figure 14. is the result of an ad-hoc CQL query against all Core relationships where both the source and target element prototypes are from the Technology domain. Figure 15. is the result of an ad-hoc CQL query against all Core relationships where both the source and target element prototypes are from the Technology domain and are identical to each other. Figure 16. is the result of an ad-hoc CQL query against all Core relationships where both the source and target element prototypes are from the Technology domain and are different from each other (non-self referencing). Figure 17. is the result of an ad-hoc CQL query against all Core and Derived relationships where both the source and target element prototypes are from the Technology domain and are different from each other (non-self referencing). 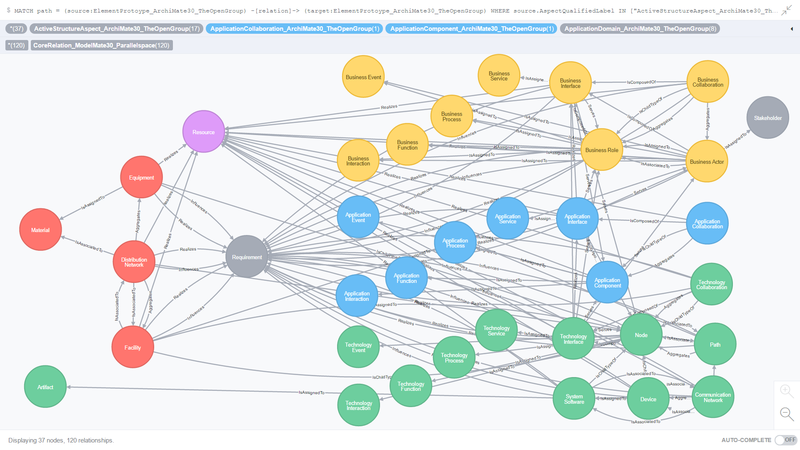 Figure 18. is the result of an ad-hoc CQL query against all Core and Derived relationships where both the source and target element prototypes are from the Technology domain and are connected to the Node element prototype. Figure 19. is the result of an ad-hoc CQL query against all Core relationships where the source and target element prototypes belong to the Passive Structure aspect. Figure 20. is the result of an ad-hoc CQL query against all Core relationships where the source and target element prototypes belong to the Active Structure aspect. Figure 21. is the result of an ad-hoc CQL query against all Core relationships where the source and target element prototypes belong to the Behavior aspect. Please add your comments and feedback to the end of this article. Queryable being the keyword. This article describes the ArchiMate Graphitization Project. 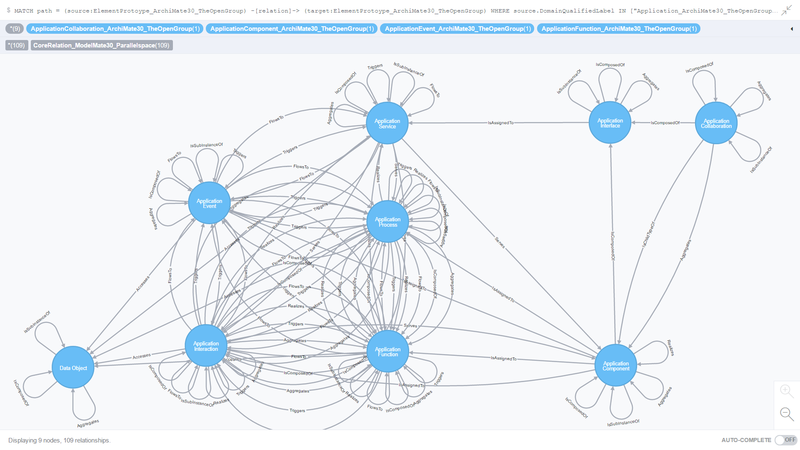 The first step in the ArchiMate Graphitization Project was to consolidate and make consistent these 4 data sources; or rather, attempt to consolidate and make them consistent. The Appendix B Tables are not very usable (i.e. not machine-readable in their current form) and hence, can only be used as a secondary, passive reference. These tables are also known to have some bugs which are expected to be fixed in the next release of the ArchiMate Specification. 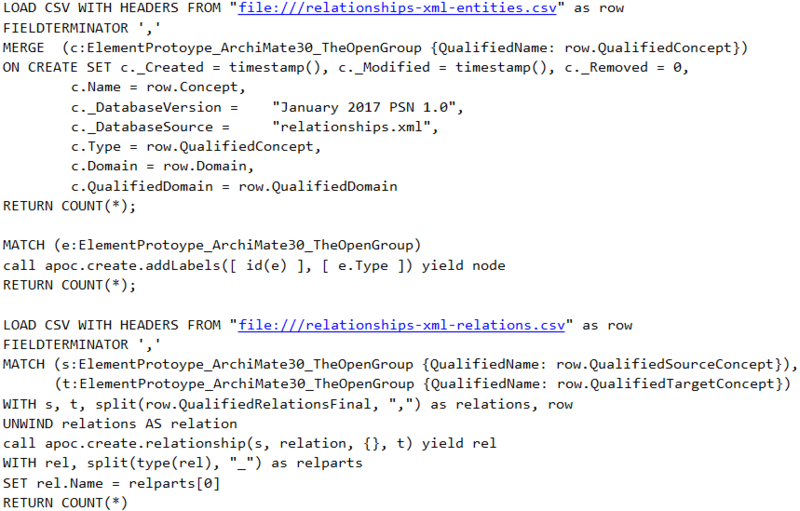 The most reliable, most usable, and most complete data source is the Archi 4.0 project’s relationships.xml file; defining 11,000+ relationships. This file’s only drawback is that it includes all relationships – both Derived as well as the Core Subset – and does not have any tags or other markings to identify the Core relations; regardless, this file proved to be exceedingly valuable. The Appendix B Tables suffer from this same problem: no tagging to help identify the Core relationships. 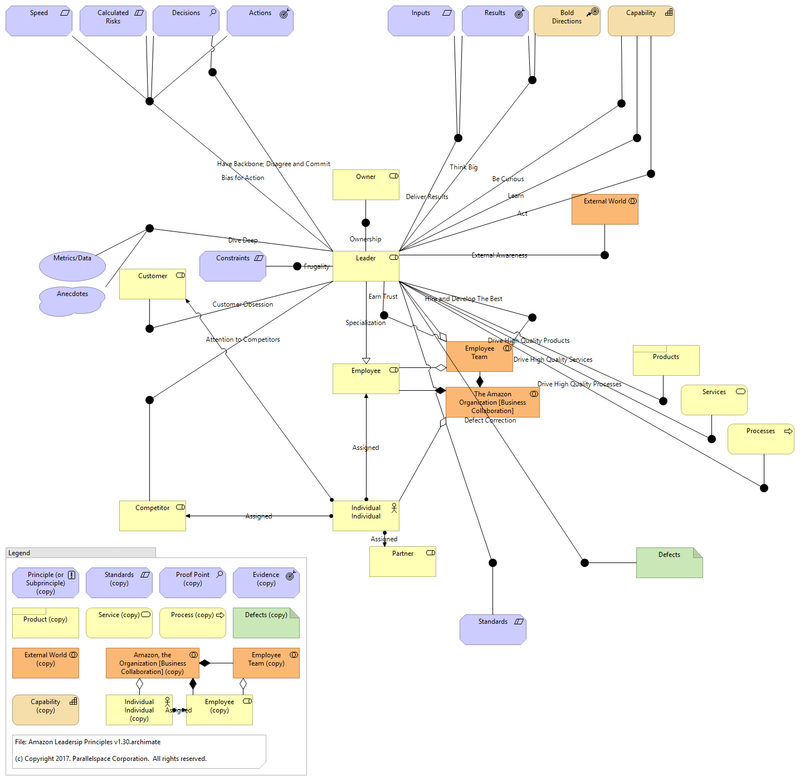 Gerben Wierda’s ArchiMate 3.0 metamodel PDF is the best and internationally renown reference for the most commonly used ArchiMate relationships (what I think of as the ArciMate Core Subset). Gerben has done an excellent job of documenting these for ArchiMate 2.1, and now, ArchiMate 3.0. Using his PDF data, we were able to troubleshoot a number of missing as well as extra relationships across all 4 data sources [Thank you Gerben]. Colin Coate’s ARKWRT is also an excellent tool. 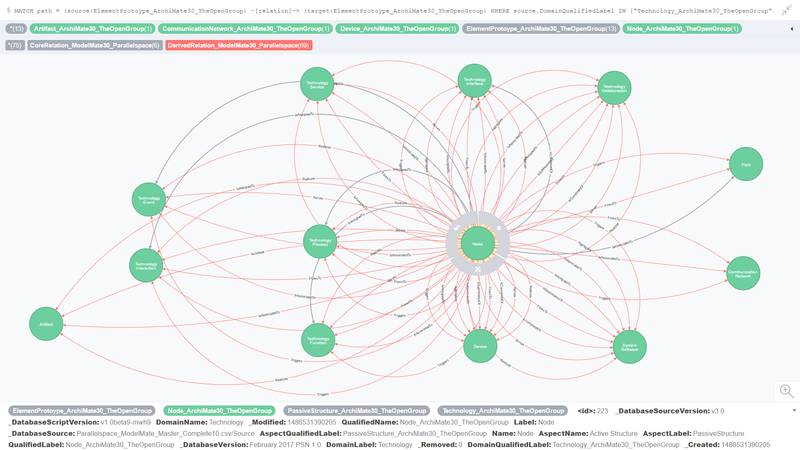 I learned about Colin’s tool too late into my project cycle to use it; regardless, Colin has also been very helpful based on his deep knowledge of the ArchiMate specifications. 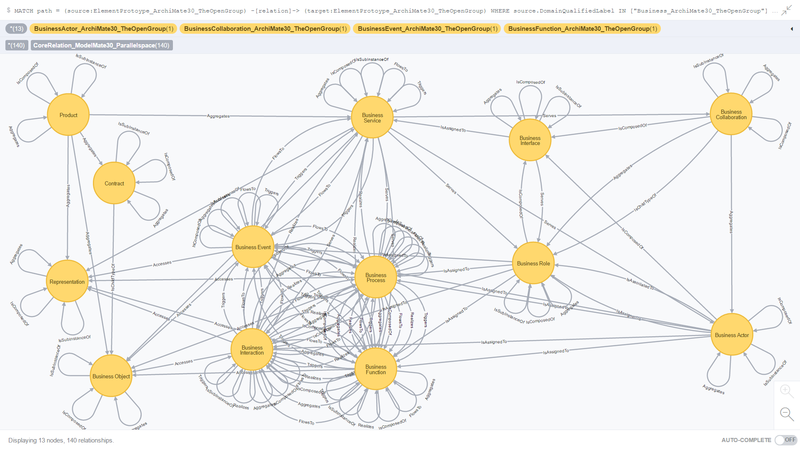 For this iteration of the ArchiMate Graphitization Project, I combined the relationship.xml data with Gerben’s PDF data. I was careful to tag each element and relation with its data source(s). The Appendix B Tables were used as a secondary reference for verification purposes. I won’t go into detail about all the steps but I do want to emphasize that this was a very straightforward process once I had some good data – as in any Data Science project. 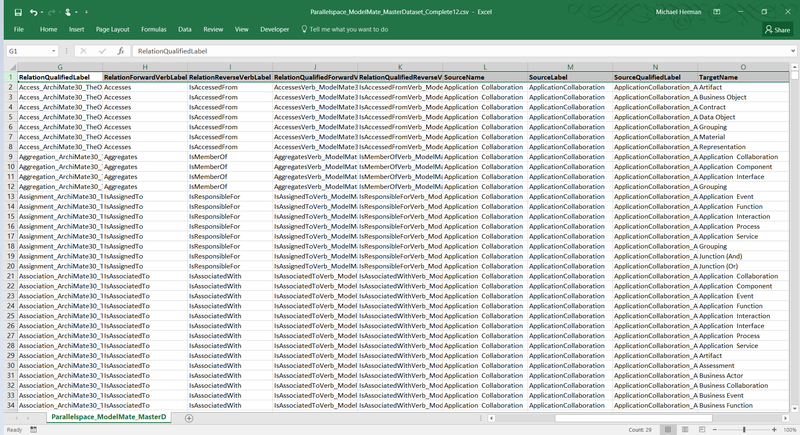 The relationships.xml file is well formed and opened nicely in Excel 2016 (as well as earlier versions of Excel no doubt). 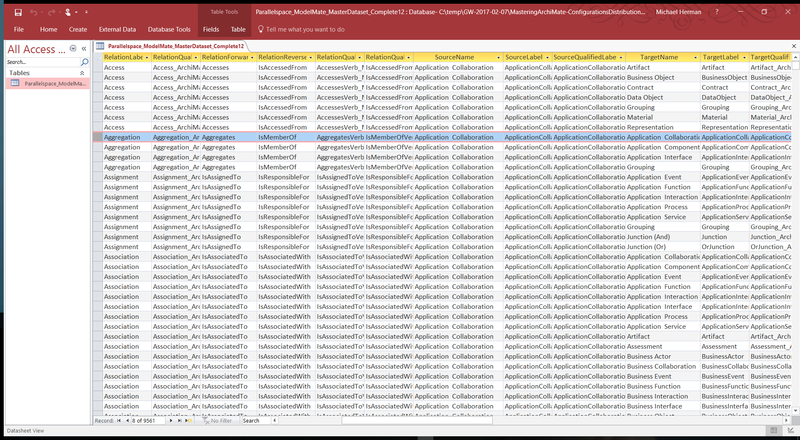 It was simple to save it out as a CSV file (after some preformatting to create namespaces for the AchiMate element and relationship names). 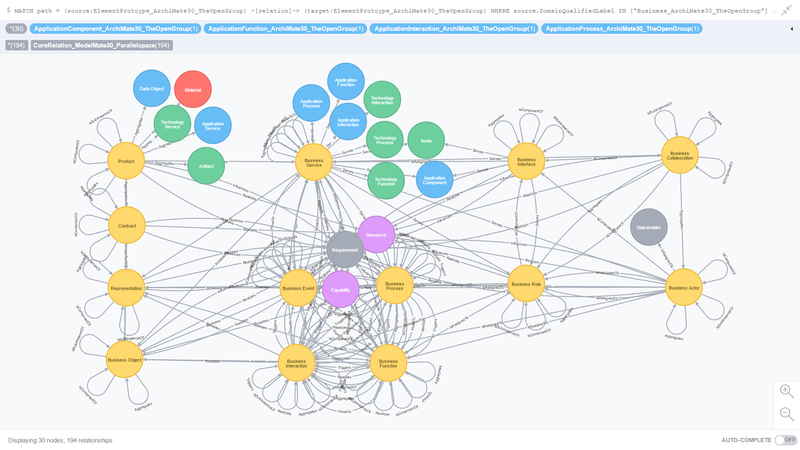 Here’s a sample that resembles what the final CSV file looked like before ingesting it into Neo4j graph database (click the figure below to enlarge it). The relationship naming scheme is based on the ModelMate Verbs notation described in the article Crossing the EA Chasm: Re-visioning ArchiMate 3.0 Relations as Verbs. There were a couple of additional steps such as assigning weights (strengths) to each of the relationships based on the relationship type, tagging relations with a data source code, etc. that were part of the overall process. 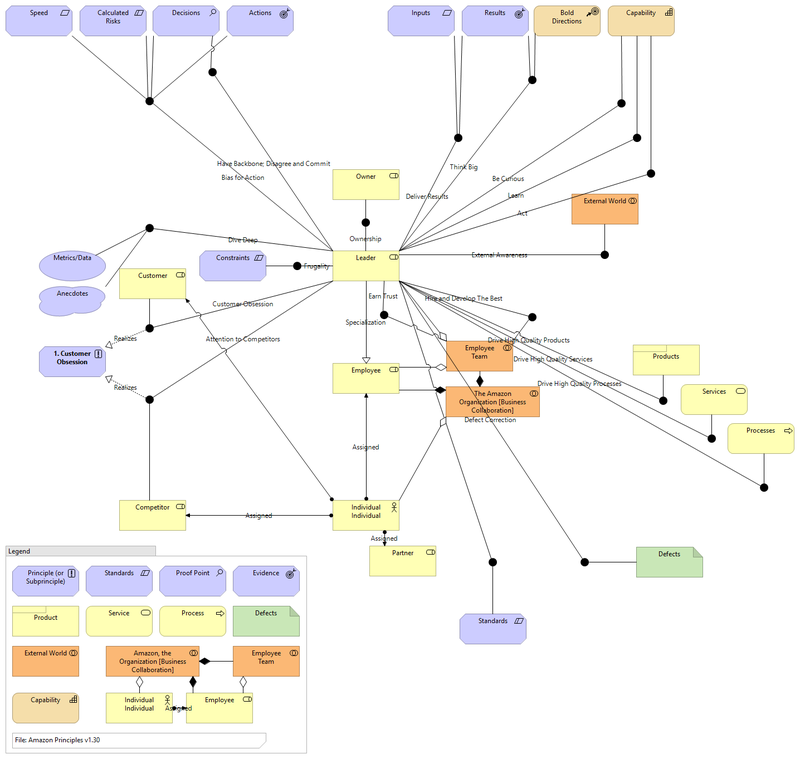 The biggest challenge for the project was to see how easy it would be to recreate something that looked similar to Gerben’s ArchiMate 3.0 metamodel PDF. Here’s a copy of the actual Cypher query. It’s not optimized but only takes a few seconds to run. The highlighted clauses encode the margin notes on page 1 of Gerben’s PDF. The unhighlighted clauses at the bottom (that refer to Strength) reduce the multiple relations-per-element-pair returned by the first half of the query to a single relation per distinct element-pair (based on the relative weight or strength of the relationships for each pair of elements). Please post your feedback, questions, and comments below.